An investigation has been launched after a flight out of Belfast International Airport was grounded when the aircraft was damaged on the taxiway. 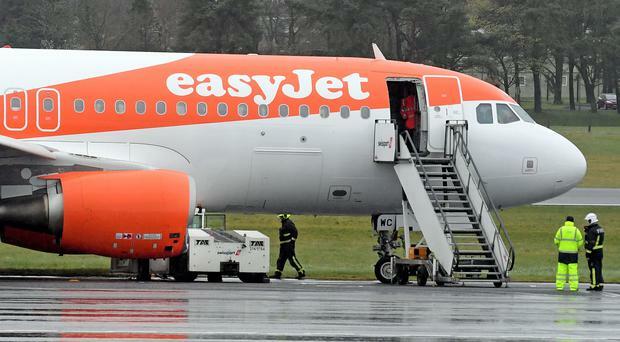 Passengers were taken off the easyJet flight from Belfast to Malaga on Wednesday afternoon after one of the engines was hit by an airport vehicle, it is understood. A easyJet spokeswoman said: "easyJet can confirm that flight EZY6755 from Belfast to Malaga has been delayed as a result of damage sustained from a pushback tug. "All passengers disembarked normally. They have been provided with refreshment vouchers and support from our ground staff in Belfast Airport. "A replacement crew will operate the flight to Malaga on a replacement aircraft shortly. We apologise to customers for any inconvenience caused. "The safety of our passengers and crew is easyJet's highest priority and we have launched an urgent investigation with our ground handling provider at Belfast Airport. A spokesperson for Belfast International Airport said the airport remains open as usual. “We can confirm we are dealing with a ground incident involving an aircraft, passengers disembarked as normal and have returned to the departure lounge," they said. The incident was dealt with by 7.30pm and passengers continued on their journey to Malaga.